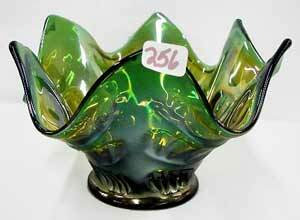 This Diamond and Rib whimsey vase, necked in at the top into a spittoon shape, sold in 1999 for $1,100. It is green and has some slight roughness around the top edge. As it has only been swung slightly and is only 5 3/4 inches tall, it shows the pattern very well. A similar whimsey sold in 1996 for $1,700; another (or possibly the same), for $1,000 in 2003. 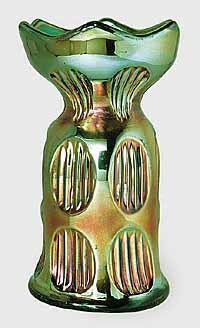 This green 4 1/2-inch whimsey, also from a standard size vase mold sold in 2007 for $2,000. It has a 1911 penny molded into the base. Photo courtesy of Wroda Auctions.